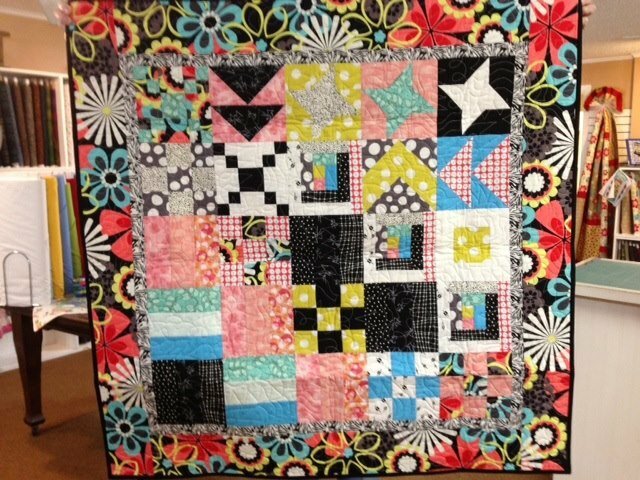 Must have taken Beginner Quilting Class from Cyn here at Quilters Cottage or have beginner knowledge, either from another beginner class or quilting experience. In these 4 classes you will learn several sampler blocks, learn how to create 1/2 square triangles, flying geese, Irish chain, 9-patch, fence rail, friendship star and several other blocks & techniques. You will learn how to make all your blocks turn out to be the correct size along with fabric selection experience and pattern reading. Sewing machine Please make sure your machine is in good working condition and bring your accessory box and user manual. If you have a 1/4" quilter’s foot for your machine bring it, if you don’t have one you may want to see if one is available for your machine and order one according to your make and model – it really is almost a must for quilting and if anything it makes your like so much easier!!! Talk to the shop about this if you are confused about this foot. Make sure you have a new needle in your machine. Ivory or light grey all purpose cotton thread. One spool is plenty and go ahead and wind two bobbins. Aurifil is my preferred thread brand. Rulers – I suggest the 8 1/2” x 24” ruler, see Quilter’s Cottage for my suggestion (Creative Grid) & a 12” x 1” for trimming. We will be using several other rulers and I will discount them to you and talk about during class. Either I can meet you at the shop on a Friday or Saturday to pick out your fabric or one of the girls at the shop can help you. Have your fabric bought before first class. No not pre-wash it. Start with a great print for the border and match the inside pieces to accent that border print. I look forward to our class and if you have any questions or need help please call me!